Tessa is building a straight path along the side of her house. Each stone she lays is 1 m x 1 m. She drew a scatter plot and a table of values to help her predict the perimeter of her path. Using the scatterplot, find the value of letter A in the chart. Find the value of letter B in the chart. Find the value of letter C in the chart. Find the value of letter D in the chart. 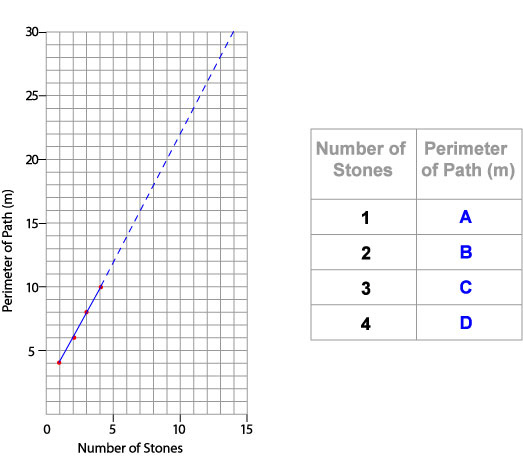 What would the perimeter of the path be if Tessa laid 8 stones? What would the perimeter of the path be if Tessa laid 11 stones? If the perimeter of the path is 30 metres, how many stones would she need?